A high-quality and affordable bass ukulele, crafted from choice materials with a high-quality onboard active preamp and tuner. The Jack & Danny UK-BM1R Ukulele Bass is a high-quality and affordable bass ukulele, expertly crafted from choice materials and featuring a high-quality onboard active preamp and tuner, producing a rich, warm sound both amped and unplugged; comes complete with super durable Aquila strings. Built with a rosewood fingerboard connected to a sapele body, this ukulele features a semi-gloss natural finish with black binding on the top and back. It only took me a couple of minutes to conclude that thus was a very disappointing product from the usually very reliable Musicstore. Firstly. This U Bass was totally unplayable due to the fact that the neck was humped and twisted, making the UBass unplayable unless you were prepared to put up with constant string rattle. By the way there is no trussrod, which is probably the cause of the problem. Secondly. Curiously, the U Bass sent was a completely different than that pictured online. So sadly the U Bass had to go back for a refund. I would respectfully suggest that Musicstore seriously reconsider the wisdom of putting their badge on such an inferior product. Until this episode, I had total respect and trust in their products and have always been delighted with my purchases. My advice is if you want a U Bass then look elsewhere. 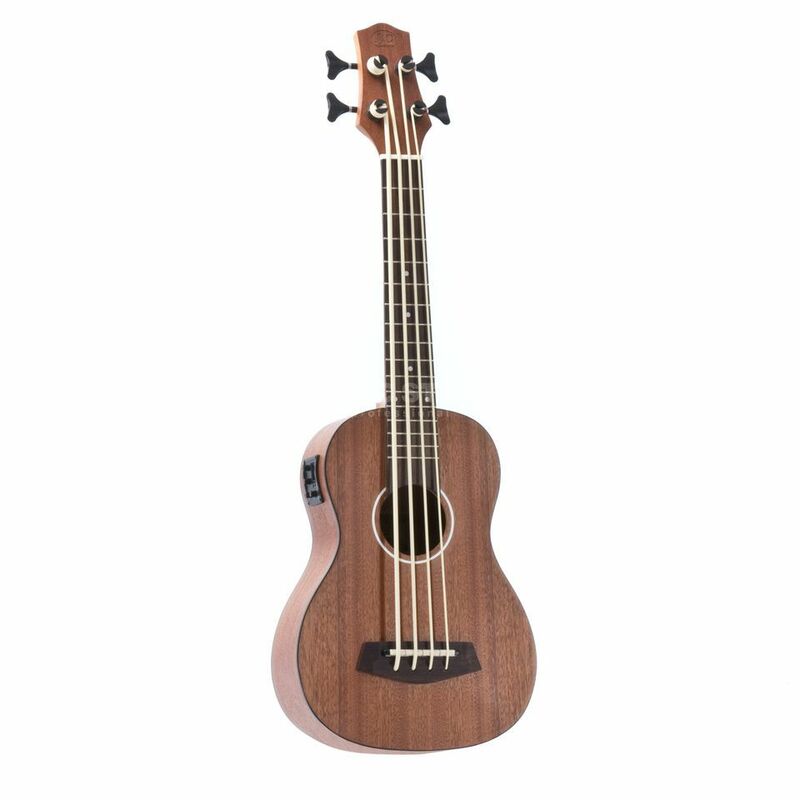 In this moment, the JACK&Danny ukulele bass is the least expensive on the market, yet its quality is good, and more than good considering the price. In addition to the very short specifications on the shop site, size is about 77x26x8cm, weight slightly under 1,1kg. 1/2 scale guitar gigbags are right for this bass: I bought the cheapest one that just protects from dust (item GIT0025838-000), however there is another one, padded, that provides better protection (item GIT0003140-004). The preamp has a 3-band equalizer plus general volume, and a tuner activated by a very small button. When activated, output is muted. Two button sized CR2032 batteries provide power to the electronics (this is the only thing I do not like much, let's see how long they last); they are located close to the jack socket. Although by reading online about this kind of instruments, I expected to do some setup, the bass I received (one day before the expected date, very quick) does not show any particular issue: strings output is even, no action problems, no sharp fret ends, good finish, and also the colour is somewhat better than the pictures. The only small issue I have is some rattling of one cable inside, which sooner or later I will fix in some way. Strings need some time before stabilizing: however actually after two days I have only the G still needing tuning every time. String material and size need some time to get used: the E string is about 5mm thick! Many turns are needed to tune, however tuners are better than expected for this price, black anodized aluminium. No strap buttons are present. While weight and size make it possible to play without support, a bad player like me has more movement freedom if the bass has a strap. For this, in few days I will add two buttons in the usual places. Finally and not the least: it also sounds good. Unplugged volume is acceptable for playing alone without disturbing (the reason I bought it), I suspect for any ensemble playing amplification is mandatory.